This free, printable business plan can help attorneys and lawyers in law offices identify weaknesses and strengths within their corporations and create projected profit and loss charts. [COMPANY NAME] provides high quality legal services at affordable flat rates to help middle class white and blue collar workers. The owner [NAME] has over 30 years experience as a licensed attorney and 20 years experience in private practice. [NAME] is fully Licensed by the Supreme Court of [STATE] and U.S. District Courts of the Western & Southern Districts of [STATE]. [COMPANY NAME] is located within walking distance of the courthouse, which is convenient for its clients. The Company is a disability-owned firm and is compassionate for servicing those in need. [COMPANY NAME] is seeking $170,000 in grant funding for the expansion of this Business. [COMPANY NAME]'s competitive edge is the customer service experience and approach [NAME] brings to the table. The affordable pricing, unassuming and good-natured approach to all clients is evident and highly appreciated. Based on the detailed financial projections, [COMPANY NAME]'s future sales for 2010, 2011 and 2012 are expected to be $138,000, $151,800 and $166,980, respectively. With 29 years of experience and well-honed expertise in all those fields of the law most pertinent to you, [COMPANY NAME] stands ready to protect your rights and help you overcome legal battles of all kinds. Whether you're facing the emotional difficulties of divorce, the terrifying possibility of imprisonment for a state or federal crime, or simply need help with the probate process in the wake of a loved one's death, we can help. [COMPANY NAME] is located within walking distance of the courthouse, which is convenient for its clients. The Company is a disability-owned firm and is compassionate for servicing those in need. 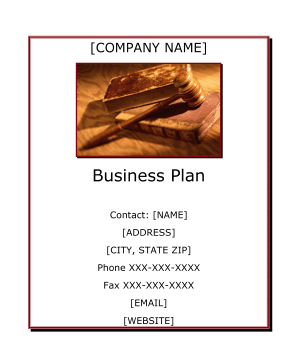 [COMPANY NAME] is a Sole Proprietorship entirely owned by [NAME]. [COMPANY NAME] was established on July 26 of 1990 and has recently been experiencing losses resulting from the current economic recession. Sales figures in year 2007, 2008 and 2009 were $108,767, $139,398 and $97,505, respectively. The Earnings for this period were ($22,250), ($2,767) and ($19,655), respectively.